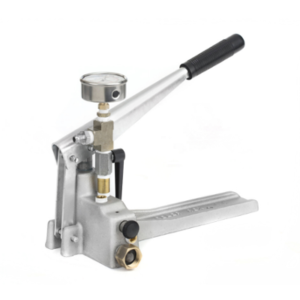 Our gas-powered test pumps are the optimal solution for certifying newly installed or repaired water lines, sewer lines, commercial sprinkler systems, and pressure vessels. 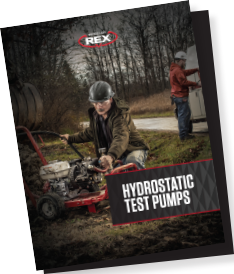 All gas-powered hydrostatic test pumps are equipped with Briggs & Stratton INTEK Pro™ or Honda engines that are fully backed by their manufacturers’ warranties, so you know you’ll have the reliable power to tackle any job. For maximum durability, recirculating systems provide pump protection as well as water conservation for efficiency. All our units come standard with a 10-foot, high-pressure output hose and a 10-foot suction hose with strainer. 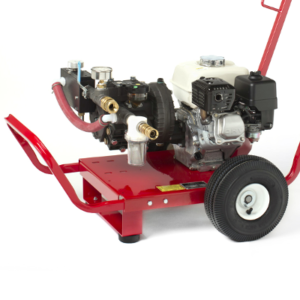 Our pumps come standard with wheeled carts, so you can easily take them where the work is. Cage type units are also available. When you need to handle the toughest jobs, turn to our diaphragm pump series. These rugged, dependable test pumps can be run dry and can handle up to a 10% chlorine solution. All models can be preset to test lines ranging from 0 to 250 PSI, 300 PSI, or 500 PSI and have high volume output with options from 10 GPM, 15 GPM, and 26 GPM. Make testing simple with the twin piston pump series. These units automatically and accurately build pressure and are capable of testing lines up to 400 PSI while pumping up to 10 GPM. Get dependable performance for a great value with the roller pump series. Featuring an inline strainer with a stainless-steel filter and clear bowl, this unit is easy to maintain and can test up to 300 PSI while pumping 5.4 GPM. Whatever your needs, our electrically powered hydrostatic test pumps are ready to meet the challenge. Ranging from compact, hand held-units to robust cart-based systems, this series of pumps supply power where you need it – whether testing and certifying sprinkler lines, commercial plumbing installations, or industrial systems. With smooth, quiet operation, our electrically powered pumps provide a comprehensive, best-in-class testing solution, meeting industry needs with the highest quality products we can make. Compact, lightweight, and portable without sacrificing power or durability; the portable series is the professional’s choice for certifying fire sprinkler lines, commercial plumbing, and industrial testing. The portable series features built-in adjustable pressure regulation. 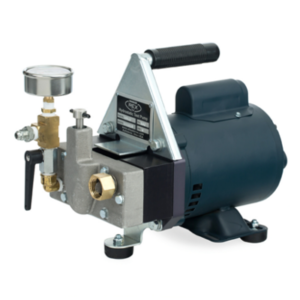 This smooth operating twin piston pump is capable of testing lines from 0-500 PSI while pumping up to 3 GPM. The twin series features a full perimeter cage with padded rubber feet to protect the pump from hazards in the testing environment. For industrial testing, the triplex plunger series is the best solution we build. These pumps are capable of testing lines up to 2,000 PSI with smooth, quiet operation. The triplex series is available in both cage and cart types. 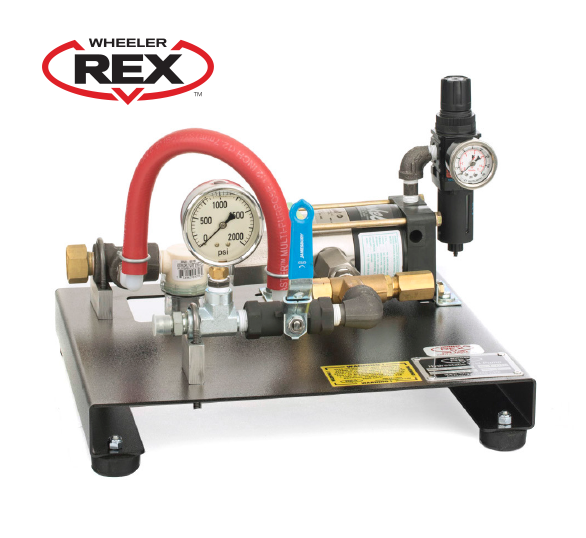 WHEELER-REX Manual Hydrostatic Test Pumps are a simple, reliable solution for testing residential water lines, pressure testing small tanks and sprinklers, and boiler and solar systems. These lightweight units feature a standard 3/4” garden hose female inlet and a 9/16” – 18 JCF male outlet, a shut-off valve, gauge, and an adjustable internal relief valve, as well as a 10-foot output hose – giving you the flexibility you need to tackle any job. This durable, handheld unit is ideal for testing residential water lines, small pressure tanks, sprinkler and boiler systems up to 300 PSI. When you need more pressure for testing residential water lines, small pressure tanks, sprinkler and boiler systems the Model 29201 can test up to 1,000 PSI. This unit is specially designed for use in heating, compressed air, refrigeration systems, oil installations and sprinkler systems. It features stainless-steel construction for extra durability, an integral 2.6-gallon stainless-steel tank to provide a water source if one isn’t readily available, and a valve that doesn’t need to be closed manually to hold a pressure test. For specialty applications including ultra-high pressures, fire hose testing, and trash pumps, we have specialty hydrostatic test pumps designed to meet these tasks head on! For industrial, high PSI applications our pneumatically powered hydrostatic test pumps can achieve PSIs of 1,500 PSI, 3,000 PSI, or 10,000 PSI, ensuring you have more than enough power to meet your needs. Our electric powered fire hose tester is capable of 500 PSI while pumping 3 GPM. 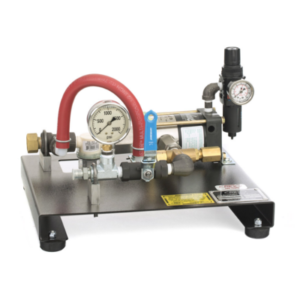 For increased volume, our gas-powered hose tester delivers 400 PSI while pumping up to 10 GPM. Both units are designed to safety test fire hoses to NFPA standards and come standard with a 2-1/2” Swivel quick-fit inlet, and a 2-1/2” NST outlet, independently controlled ball valves and are mounted on swivel casters for easy mobility. 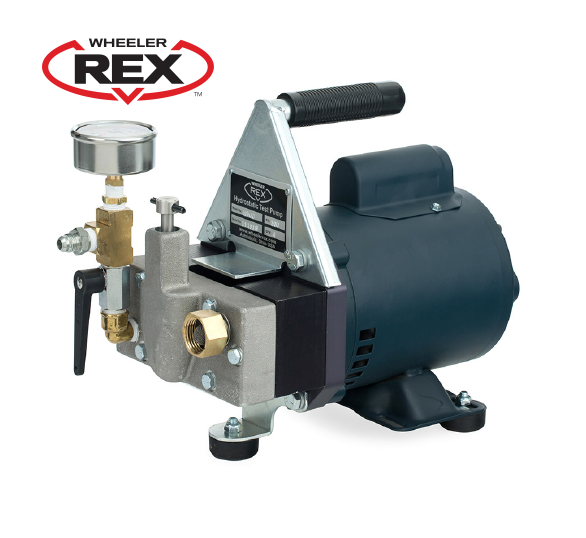 For heavy duty, waste-handling applications, look no further than WHEELER-REX Trash Pumps. These units handle solid wastes with ease and are simple to open and clean for easy maintenance. Trash pumps are equipped with a roll cage to protect both the pump and engine as well as a stainless-steel intake hose strainer. Fame is not our mission. The average person may not have heard of WHEELER-REX. That’s just fine with us. We have been quietly producing the very best, handmade, personally inspected and serviced tools for water works and plumbing contractors since the 1950s. Our Premium Hydrostatic Test Pumps are designed to meet the demands of the contractors we serve. With decades of experience, we know the challenges you face. 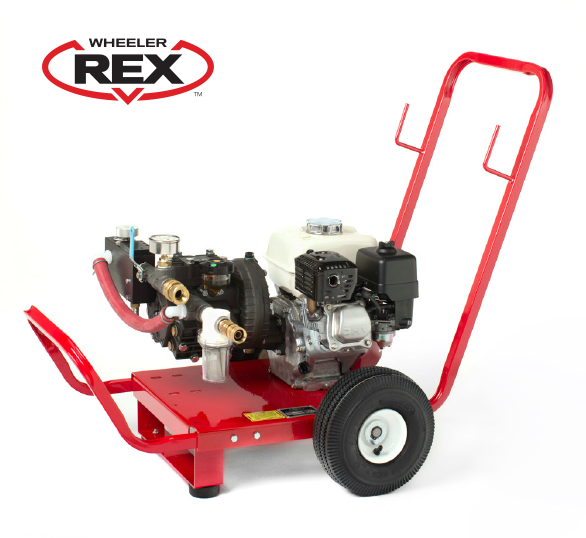 Every WHEELER-REX hydrostatic test pump is designed and built from the ground up to meet those challenges and more. 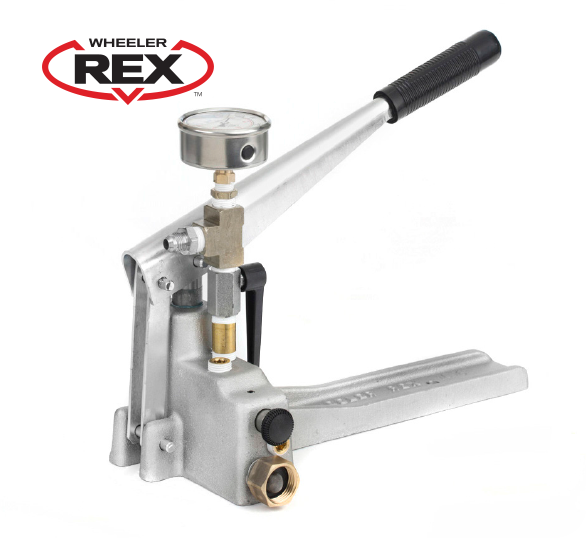 We individually inspect every pump we make, so you’ll never have to worry with WHEELER-REX.